Over the last few months, I've been incredibly lucky to get to know artist Michele Fandel Bonner. 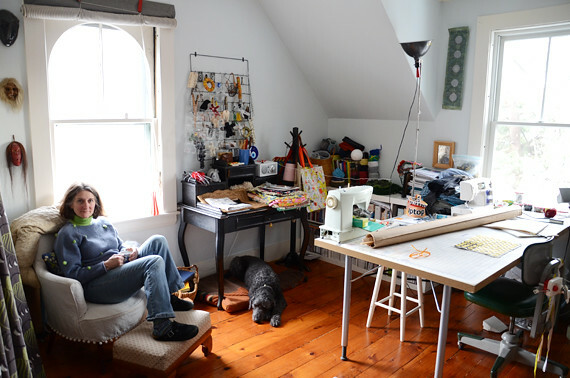 Earlier this week, she welcomed me into her home and her studio to speak about her work. When you first meet Michele, she is kind, funny, and completely unassuming. I knew her as a very skilled knitter, but it was months before I found out about her artwork. "I'm still learning to call myself an artist," she tells me sheepishly. Michele lives on a quiet street in Marblehead, MA. As I pull up to her house, I immediately recognize it - her mailbox is the only one covered in decorations. Her home is very much a reflection of herself. 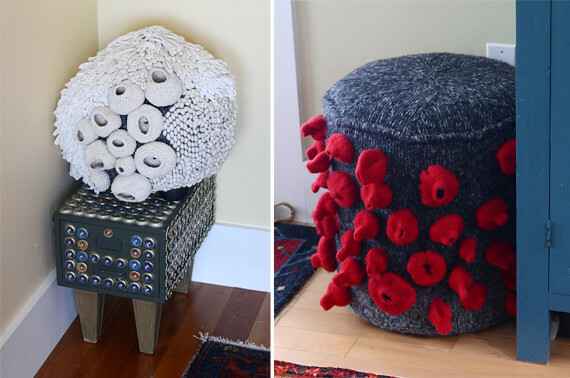 Michele is a sculptor and fiber artist, and her pieces can be found in every room of the house. Michele works with the common and mundane, taking things out of their usual context. 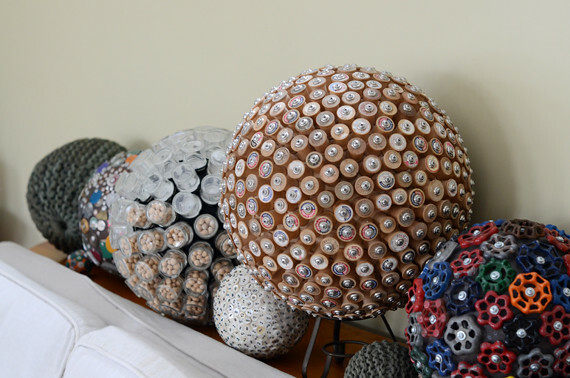 She explores consumerism and waste, with found and recycled objects being a constant theme in her art. 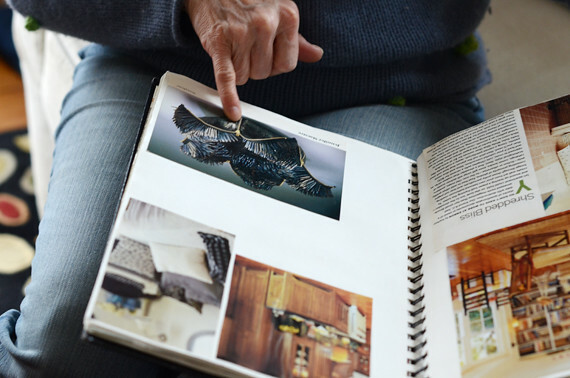 She spends years collecting the right materials; she has a collection of sweaters obtained at thrift shops, which she painstakingly takes apart. 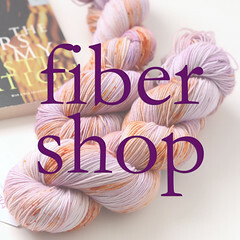 The yarn is then re-used in a new project. This is the piece that started it all. For a year after her dog passed away, she collected newspaper bags. 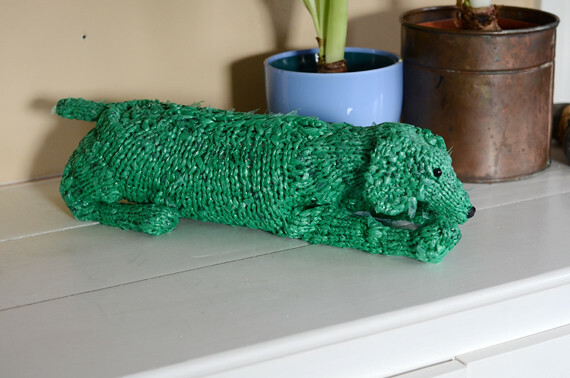 The knitted dog sculpture, which sits in her living room, now houses his ashes. 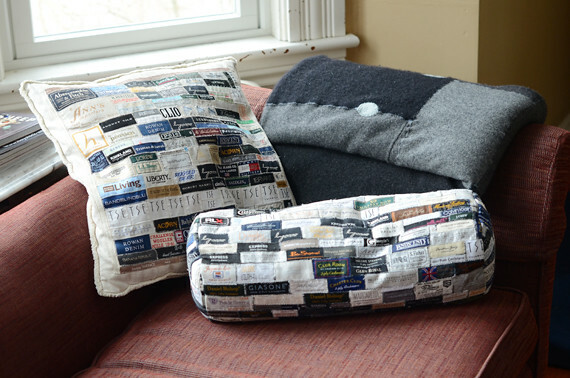 These hand-sewn pillows, covered in clothing labels, are a precursor to her current work. Michele explains has only recently become comfortable with the idea of creating non-functional art. 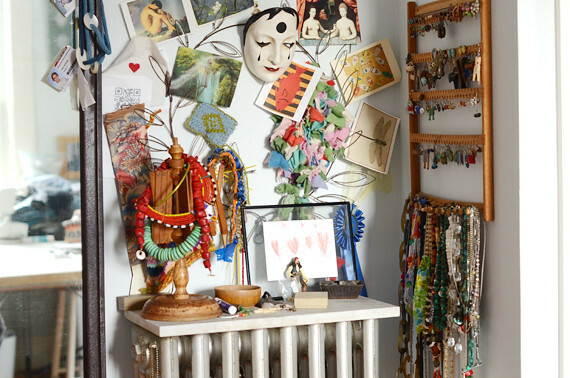 Upstairs in her studio, I get to see the current collection she is working on. She's currently preparing for an exhibit at the Marblehead Arts Association in April. Her patience amazes me. 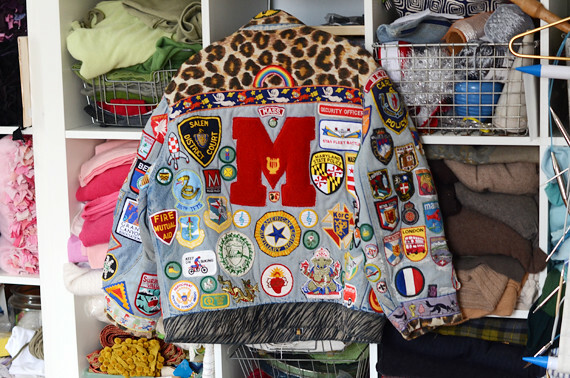 Many of her projects have taken several years to complete; this jacket has been an ongoing project for over three decades. One of her current fixations is clothing labels. 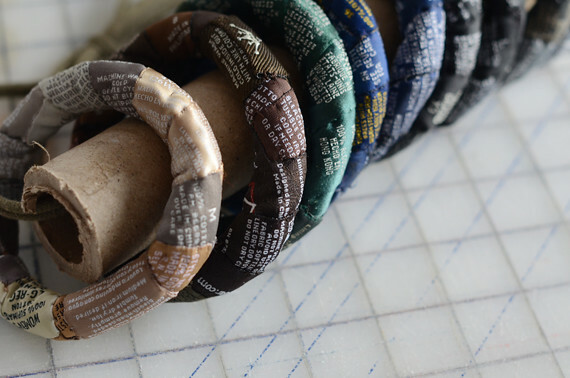 She recalls her childhood and feeling pressured to care about brand names. "The clothing has no value without the label, but if you remove the label, the label is worthless by itself too," she explains. 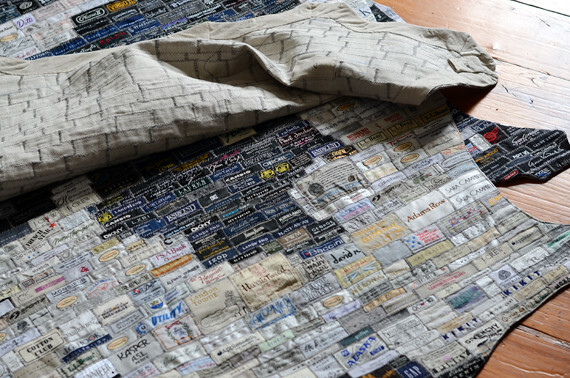 She carefully removes hundreds of labels from discarded clothing and re-assembles them into something new. The work is a rejection of brand names and consumerism. Michele humored me for hours, telling me the stories behind her projects, her inspirations, and some of the recurring themes in her work. "I'm obsessed with hands." She came from a background where handiwork was not appreciated, and has since surrounded herself with images of hands in defiance. One of the projects in her future involves thousands of gloves. At the end of our visit, she showed me her journals. "In a fire, these are what I would save." She describes them as "my Pinterest before Pinterest." 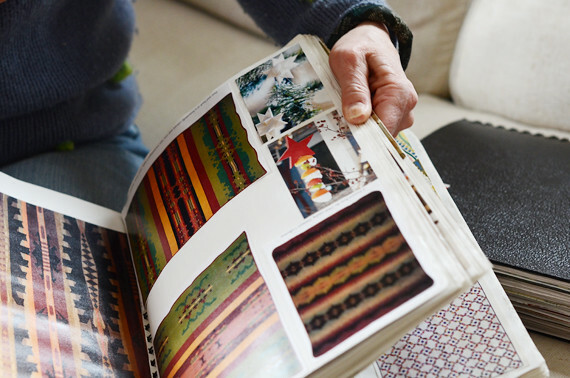 The pages are filled with beautiful photos and clippings, and quick sketches and notes. 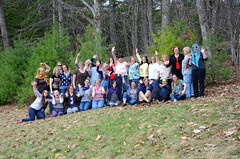 There is so much more to tell you about Michele, it was so hard to edit down this post! Since I can't tell you everything, I suggest you come see her next exhibit and pick her brain in person! Her show at the Marblehead Arts Association runs from April 26th to June 8th. 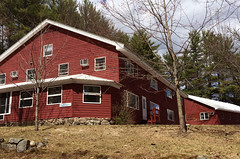 The Opening Reception will be on Sunday, April 27th from 2-4 pm. She sounds wonderful and fascinating and genuine and and and...I could keep going! You were lucky to have had time with her :-) That is my dream - someday - to be able to just create. 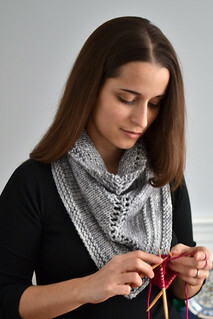 Michele is lovely and also an avid knitter! If you're ever in Salem, you can absolutely meet her.